NASA's Curiosity rover on Mars recorded this image of the sun setting in a blue-tinged sky, the first picture taken in full color in its nearly three-year mission. It's one of a series of photos taken during the evening of April 15, 2015, but just released by NASA. 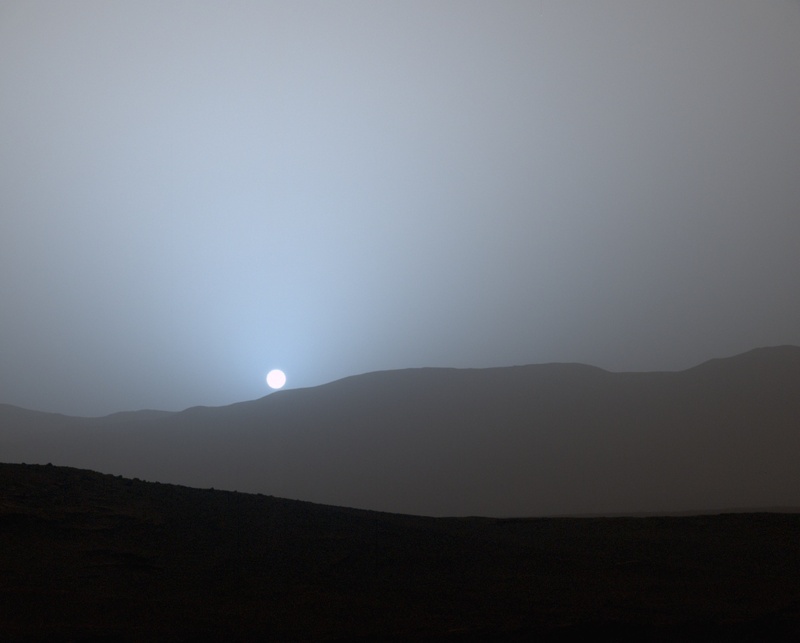 Why does a sunset on the red planet appear blue? The answer lies in dust particles, explains Mark Lemmon, the Curiosity science team member who planned the observations. "The colors come from the fact that the very fine dust is the right size so that blue light penetrates the atmosphere slightly more efficiently," he said in a statement posted by NASA. "When the blue light scatters off the dust, it stays closer to the direction of the sun than light of other colors does. The rest of the sky is yellow to orange, as yellow and red light scatter all over the sky instead of being absorbed or staying close to the sun." The image comes from Curiosity's Mast Camera, which sees colors very similar to what human eyes see, though it is a little less sensitive to blue.